So I decided to read the fantasy/mythology book that was on just about every single best of 2018 list that I came across just to see what all of the fuss was about and for the first few chapters I was not convinced and then Circe finds out that she is a witch and I was hooked. I admit that I don’t know Greek mythology very well. Sure I have the two-volume Greek Mythology set from the Folio Society that I think probably every English Lit major got suckered into ordering *For Free* because while we’re book-smart we sure didn’t learn our lesson from Columbia House. But I didn’t ever get around to actually reading it, and maybe my cursory knowledge of mythology is also why I enjoyed the book as much as I did. It’s just not my bag, so I probably won’t be picking up Miller’s earlier, and equally lauded, Song of Achilles. Pre-race shake out in the chute through the construction zone under Granville Bridge. On race day this section descends to the 3 KM marker. Coming back it’s the last incline, followed by a 600 metre sprint to the finish. 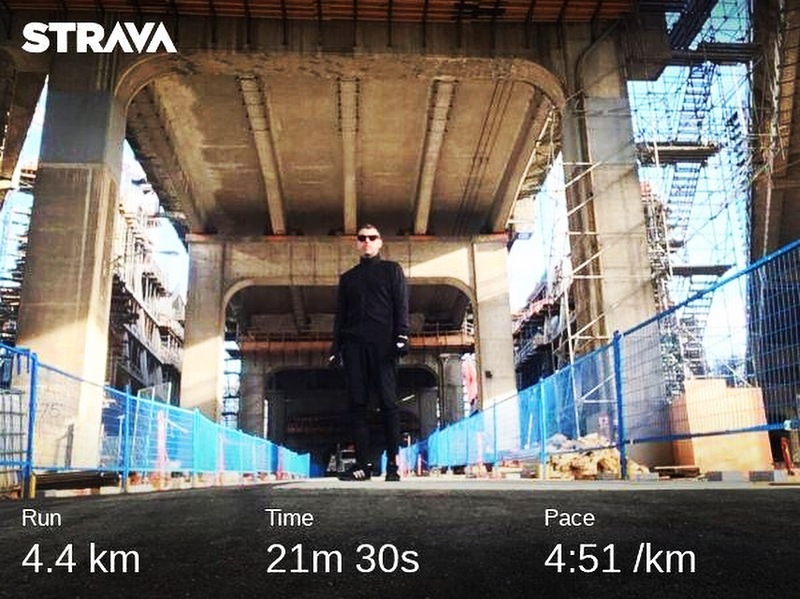 And speaking of achilles, on Wednesday I did a 10 km load test to see how it would hold up at something farther than the five or six I’ve been running the past few weeks. It was okay enough that my physiotherapist gave me the green light to run the First Half Half Marathon this morning on the promise that if it turned badly I would walk off. 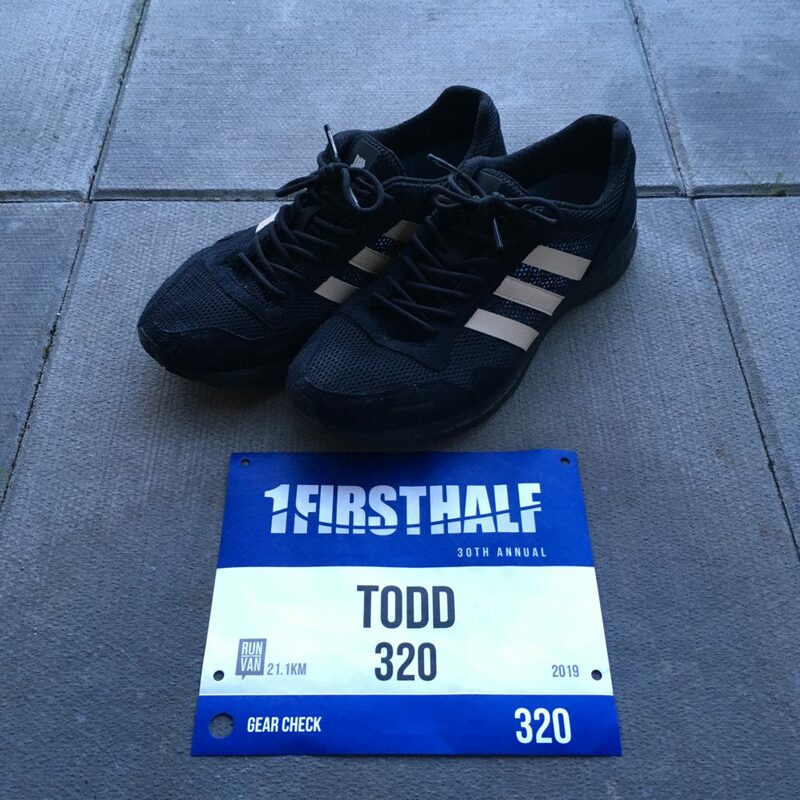 My race day plan was to test my achilles tolerance and test my current fitness level so I divided the race into thirds – 7 KM easy, 7 KM at goal marathon pace, and 7 KM at whatever was left in the tank. This morning was cold, hovering around -6 plus a breeze that put the wind chill at -13. I lined up with the 1:45 pace group and we set out. Garmin got lost going under B.C. Place so at 3 KM in I was guessing pace, trying to stay at 5:00/KM. Achilles started acting up and I was concerned I’d have to quit, but it plateaued and then diminished a bit through 7 KM and I pushed the pace up to 4:30/KM. At 14 KM I caught the 1:40 pace pack and I felt great so I stayed at goal marathon pace through to the finish, crossing the line at 1:37:43. While that’s over five minutes off my personal best, it’s also over five minutes faster than my First Half 2018. 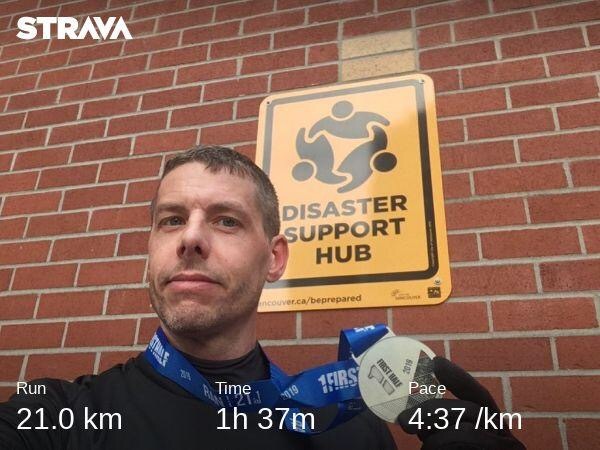 I’m still elated with how today went, from expecting to gas out, and mentally preparing to have my first DNF, instead I ran my fourth fastest half marathon race and have a huge confidence boost in my current fitness with 12 weeks until the BMO Marathon. My achilles is still a bit of a concern. While it was just okay through the race and the walk home afterward, it’s less happy with me right now. So we’ll see how it feels in the morning. For now I’m too runner’s high to worry.